Council on Library and Information Resources (CLIR) invited about 25 individuals on February 2008 and had discussion with topic “How should we be rethinking the research library in a swiftly changing information landscape?” It then published a report in August 2008 titled No Brief Candle: Reconceiving Research Libraries for the 21st Century. I have the same question as well, for I still don’t really grasp the social implication of tagging, aside from whatever stuff Dave Weinberger said on his ‘Everything is Miscellaneous’ blog on tagging. Back to library catalog tagging: if I were a student and found a useful resource for my course, then I probably would tag it with my course number and the topic of the paper my professor assigned to me. That would make it easier for me to find that resource again. If my classmates did the same thing, then I could get a list of resources for my paper. However, I probably would use the catalog as an “on demand” activity. That is, I would use the library catalog as needed and if I find a resource suitable for my paper, I want to get it right away and prefer none of my classmates find out about it. Chances are, my classmates would do the same thing. Tagging almost becomes a moot point. OK. This doesn’t help. Sorry. This might be different if I did a group project. Each of us could tag resources that would be useful for our project. We could have a list of resources that can be listed on our project report. That tagging collaboration would still be a short-live activity, however. Thanks for the pointer. I definitely expect most people tagging are tagging on content, not on “why”, I just want to know _why_ they’re tagging on content! Tagging seems to be a representation of how people would like to see things organized related to their activities. It could serve as a context reminder. WorldWideScience.org is a collaborated effort that allow scientists to do search on national and international databases. It was developed by the U.S. Department of Energy’s Office of Scientific and Technical Information in partnership with the British Library and other sources. Pretty cool effort, considering they have to deal with various databases with different metadata, database structure, and search syntax. I tried it out by using my usual dorky word search, “java”, because I always curious how a system would distinguish it between java programming language, java island, javanese people, java language (yes, the language of javanese), and, of course, java coffee. Well, not much happening on the search result. You will get a list of results supposedly based on a relevancy and no clear categorization. However, I suppose the scientists will probably use more specific search terms and can expect to get a more precise results. Using wildcard (*) works, as well as boolean search. You click the mood and it will allow you to adjust a dial from, say, “Happy” to “Sad.” Made think, if you put the dial close to happy, how would you call it? “Not So Happy”? “Not Sad and Rather Happy”? I think I’m in the mood of reading something silly. But, yeah, “silly” is relative and it’s not one of the choices. When you get list of books, you don’t see the typical catalog results from many of the library catalogs. No call number, no location. Just titles, author, a review, and snippet of text, if available. Once you’re interested in a book, you click the Borrow button and the system will ask you which library you’re associate it and take you to its catalog system. I don’t know if they ask the affiliate library because they don’t recognize my IP address or it’s the system’s default (I am, after all, getting spoiled by WorldCat.) I also don’t know what would happen if the book I’m interested in is not available from the local library. I suppose they would do an automatic Interlibrary Loan. I hope so. 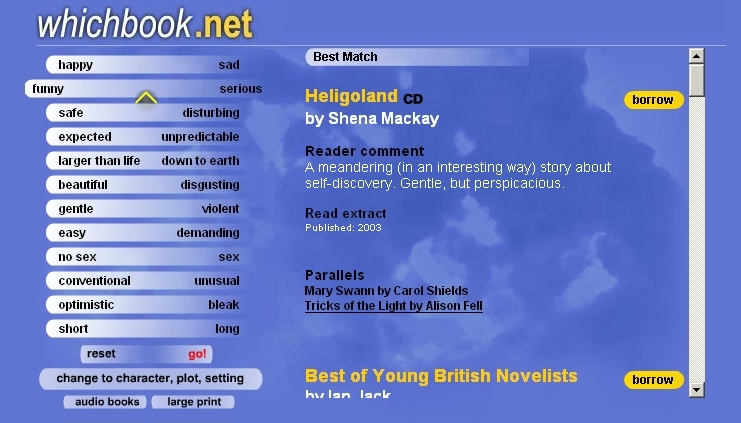 The book collection was jointly developed by public libraries from England, Wales, and Scotland. You can view the collection, but you, of course, have to have their library card to borrow the book.